Almost every Outlook user facing the moment when the program does not start. And, as a rule, it happens unexpectedly and at the wrong time! Today, we’ll take a look at few simple ways to start Outlook. If after running Outlook you receive an error Cannot start Microsoft Outlook. Cannot open the Outlook window. The set of folders cannot be opened. Microsoft Exchange is not available. Either there are network problems or the Exchange server is down for maintenance, at first you need to check the network connection and access to your mailbox server. How to Fix Cannot Start Microsoft Outlook 2016? To check the connection to the mail server you can use ping and tracert commands, also try to access your mailbox via web browser (OWA in Exchange, or https://www.google.com/gmail/about/ if you are using Gmail). If the mail server is available, open Task Manager (SHIFT+CTRL+Esc), switch to the Details tab. Find and terminate all outlook.exe processes (Right click -> End task). In case the Outlook succesfully started in Safe Mode, disable additional and third-party extensions: File -> Add-ins -> COM Add-ins -> Go -> Clear all COM add-in checkboxes. Close Outlook and try to start it in the normal mode. If this solution helped, turn on the add-ins sequentially and restart the Outlook until you find a problem extension. Sometimes Outlook cannot start due to the corrupted Navigation Pane profile. To start Outlook with an empty Navigation Pane settings, you can delete file Outlook.xml in the folder %appdata%\Microsoft\Outlook. 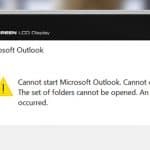 If during the Outlook start you receive error Cannot start Microsoft Outlook. Cannot open the Outlook window. The set of folders cannot be opened. An unexpected error has occurred – most likely, your PST file with mail items is damaged. 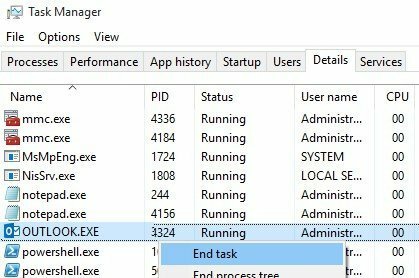 Kill outlook.exe process (and other processes that use the pst file) and run Scanpst.exe. Select your pst file with Browse button (by default you can find pst files in the folder C:\Documents and Settings\%username%\Local Settings\Application Data\Microsoft\Outlook\). Now it remains to press Start and the program will start checking. When scanning is complete, Scanpst will show the result of scanning. We just have to click the Restore button. Because this utility can only scan one file, this procedure must be done for each file separately. After that, you can start Outlook. If all the above methods didn’t help you, try to create and configure a new Outlook profile (Control Panel -> Mail item -> Add) and reconnect your PST files. Hello. I also experienced this issue being unable to start Outlook 2016. It appeared that I had downloaded a wrong version (32 bit) from the Microsoft page. My PC is a 64 bit computer. Maybe, that could be the reason why Outlook suddenly crashed irreversibly. After removing Office 2016 and re-installing the entire Office 365 package again (this time for 64 bit PCs), Outlook was still unable to start, nevertheless. A reason might be some remaining settings caused by Outlook for 32 bit PCs (and caused by remaining files from Office 2007, too, which I had installed previously, too). I tried all of the methods suggested on this page. It seems the only one that was useful in my situation was the last one: “try to create and configure a new Outlook profile (Control Panel -> Mail item -> Add) and reconnect your PST files.” After creating a new Outlook profile (and deleting the old one), Outlook 2016 could actually start. I could then adjust some settings for PST files – and everything worked again! Thanks so much for the valuable advice.